Tiger is the neighborhood cuddle whore. Tiger does not care who you are or what you’re doing, he just wants to cuddle. Now. CUDDLE HIM, NOW! 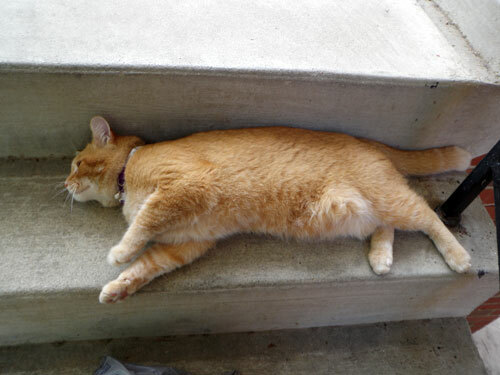 He does not care if you and your brother are carrying a heavy piece of furniture up the steps. He will fling himself directly in your path on the stairwell because he knows no one would step on a kitty so cute and lovable. So please put down the IKEA and cuddle him. NOW. The first time I met Tiger, he followed me up the front steps and lodged himself between me and my front door, begging for cuddles. He did not have a collar, so I did not know if he had an owner he was cheating on for lovin’. I petted his pretty orange furs, told him he was pretty, and then dashed in my front door and washed my hands immediately. I didn’t want the feline contingent of the Fulda family to be jealous or to get fleas. Later: So, why did you move to North Carolina? I’m thinking about becoming a cuddle whore myself. I’d like to make a little extra money. Aww! My cat is the same exact way. Cute couplet! I may have to copy that for my own cuddle whore who wanders off regularly to make the rounds of the neighborhood. My kitty isn’t allowed outside…I fear he will get lost. But he himself is a cuddle whore just as much indoors as any outdoor kitty would be. As soon as he sees you walk in the door it’s all “Meow, mew, meow meow meow” *rub your legs*get in your way*trip you* “Meow meow mew mew mew meow” until you bed over and rub his belly and give him food. That would be a great tag to put on a boyfriend! I just love a fat cat, don’t you? There is something so satisfying about rubbing a big ole belly. I love a cuddly orange puss. I think I owned the world’s only orange tabby that did NOT like to cuddle. She loved me and would cuddle me, and tolerated a select few other people, but actively disliked the rest of the world. That’s one fat kitty. Looks like everyone in the neighb feeds that cat! Sounds like this cat is a highly trained secret agent. I predict that you will find this cat to be the personal property of a highly successful personal injury attorney who makes his/her/its living suing apartment complexes for unsafe stairway conditions. I had a summer of yellow cats, spaying on my dime all of the girls. Only one allowed petting. My Tortie was a cuddle whore when she was labeled a stray. When she became a spayed house cat, she terrorized the GSD and took over. No cuddling now, just on demand petting allowed. Cats are great. creatures. Awww… he’s adorable. Do you think he’ll ever get to befriend your two kitties or would that be too much cuteness for one household? I will not say how much I hate cats but looking at Tiger she really needs a big hug and a cuddle. It’s nice know that things like her only wishes attention and love. This looks EXACTLY like my Chase-cat, belly and all – except for the what appears to be a bobbed tail. When I woke up this morning, we were spooning. He’ll drop on the floor to have his belly rubbed by the cable guy. Orange boys are the best cuddlers. What a gorgeous cat. (I love the way Americans call ginger cats ‘orange’. ) I have told my Ginger boy that he is orange – because he is, on reflection. I also love the expression ‘cuddle whore’. My boy has been out all day. I suspect he too has been lying at the feet of a stranger hoping they’ll find him cute.